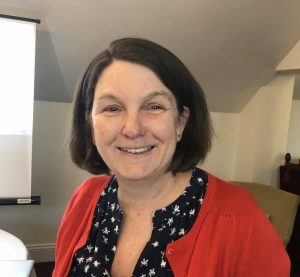 Recently, I met up with Nicola Spence, the UK's Chief Plant Health Officer: her observations took me on a hair-raising tour of the battlements that keep British trees safe from foreign invaders. 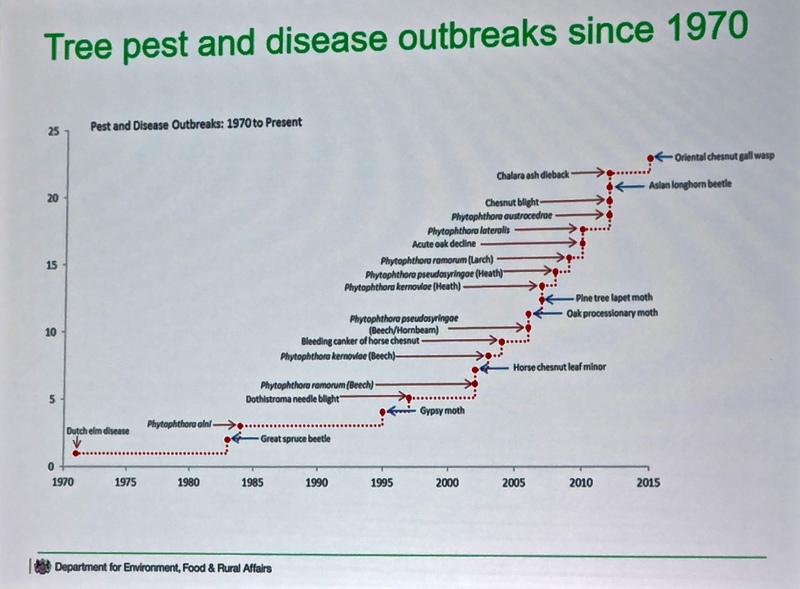 To give an idea of the importance of plant health she pointed out that in the 1960s and 1970s Dutch Elm Disease from Europe killed between 10 and 20 million trees; the recent Ash Dieback (Hymenoscyphus fraxineus), which also came from continental Europe, is in the process of wiping out about 80% of the UK's ash trees. Consequently her department is very vigilant to stop any further invasions of pathogens or insects that could attack our trees. 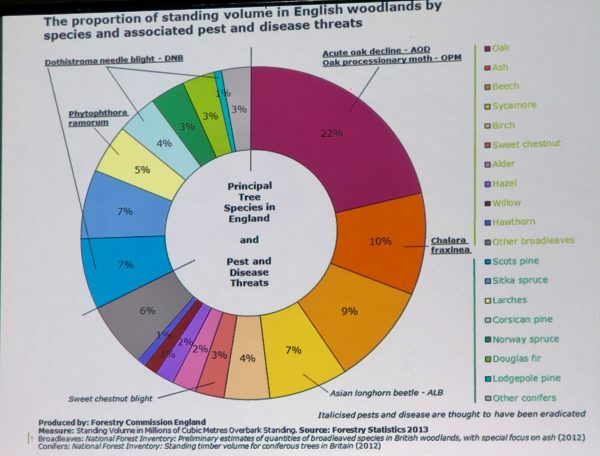 For example Defra and the Forestry Commission have successfully dealt with localised outbreaks of Sweet chestnut blight and in Kent there was a recent infestation of trees by the Asian Longhorn Beetle which meant cutting down and incinerating all trees within a 100 metre radius. At the UK's ports Nicola Spence has dozens of inspectors who make sure that any wood which comes in has been treated and is free of invasive beetles and disease. At Heathrow alone there are 20 inspectors looking at consignments from outside the EU, but despite this some insects and bacteria do still get through so her staff will ring-bark a few trees near to each port and their dead wood attracts the pests which have got past the inspectors. Some importers are particularly prone to bringing in insects that can attack trees - stone buyers and steel merchants use a lot of pallets and wood packing which is prone to carrying dangerous beetles. Sniffer dogs are also used which have been trained in finding the Asian Longhorn Beetle - Austria, for example, has 100 of these sniffer dogs which they often lend out to other countries. "In the past," says Nicola Spence, "trees have been very much neglected in research. At least now we have a genomic map for ash." Professor Richard Buggs at Kew Gardens, an evolutionary biologist, is doing pioneering work in genome sequencing on ash trees to find strains that are resistant both to ash dieback and to the emerald ash borer. This is resistant both to ash dieback and to the emerald ash borer. This is complementary to the strategy of simply breeding disease-resistant saplings from ash trees that have survived, and planting these in an attempt to counter what's been dubbed "Ashmegeddon". Nicola is also promoting tree research in many other species - in the Action Oak partnership a coalition is looking into Acute Oak Decline and other threats to oak trees. Work is also needed to understand Plane Wilt, and the "Thousand Canker" disease affecting Walnut. 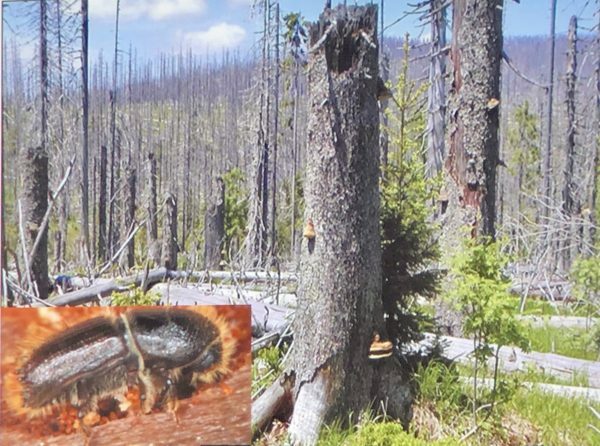 On the horizon, Nicola Spence's department are most worried about threats that could devastate our tree reserves such as the Emerald Ash Borer which is already established in Russia, Canada and parts of the US. But her job is also about increasing plant health knowledge, so Defra have been trying to stop tourists from importing plant matter - the most dangerous stowaways in luggage turn out to be potatoes, olive plants, curry leaves and lavender. More awareness may also come from the next BBC blockbuster on the environment following on from the "Blue Planet" series. The new series is apparently going to be about plants and their health and will be called "Green Planet". Plant health defences often involve action by the regulatory and legislative parts of government, so Nicola works closely with the Defra ministers, Lord Gardiner, Michael Gove, Robert Goodwill and Therese Coffey. I asked Nicola whether she would prefer that the public didn't do into woods. "On the contrary," she says - she's very much in favour of harnessing people power especially to detect any new outbreaks of disease and she explained that collectively the British were very slow to spot ash dieback: it became a recognised issue in 2012 but had probably been in the UK since 2004 or earlier. So overall Nicola Spence is upbeat about the chances of successfully defending our trees but as you might expect of a scientist and a regulator - she is a passionate advocate for more research and more vigilance.